St. Paul Mayor Randy Kelly says he welcomes his role as the underdog in the race for his office. Kelly finished a distant second in Tuesday's primary election, getting 27 percent of the vote. DFL-endorsed candidate Chris Coleman received 52 percent of the vote. The two will now face off in the general election in November. Political observers say the primary results mean that Kelly will have a tough time winning reelection. St. Paul, Minn. — Kelly seems surprisingly upbeat for an incumbent who just finished 25 points behind his challenger. The morning after his second-place finish, he greeted 22 St. Paul police officers as they left for relief duty in New Orleans. 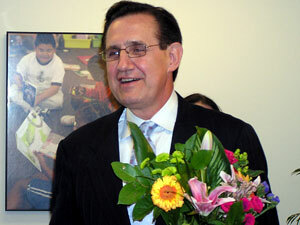 Then he brought flowers to St. Paul superintendent Pat Harvey, as she prepares to leave the district. Kelly even led a group of education volunteers in song, as they wished Harvey "Happy Trails." Kelly doesn't seem daunted by the primary results. He used a boxing analogy. "If you get knocked down, it's not a question of the fight, it's whether you get up. And I am up," Kelly said. Kelly said he looks forward to the race with Coleman, a former city council member. Kelly said he's always been focused on the general election, where turnout will likely be much higher than the 12 percent primary turnout. For his part, Coleman said he was surprised by his wide margin over Kelly. "We took him in every part of the city," Coleman said. "I won in his home precinct on the East Side. We won across the city. I won all but six precincts out of the 117 or 119 precincts in the city of St. Paul." Coleman also noted that Kelly vastly outspent him. Kelly has spent about $400,000 on the race so far, and still has about that much in the bank. Coleman has about $35,000 on hand. He said he's at a financial disadvantage, but said money won't determine the outcome of the race. "We had hundreds of volunteers working very, very hard over the last couple of weeks to get out the vote, going across the city, door-knocking, calling, doing whatever they could, and I think that effort will not only continue, but it will double or triple over the next eight weeks," Coleman said. Kelly has the backing of many major developers and business leaders. He'll need that support to try to come from behind and win in November, according to Blois Olson, co-publisher of Politics in Minnesota.com. Olson said Kelly, as an incumbent, should have done better in the primary. Kelly's predecessor, now-U.S. Sen. Norm Coleman, fared better with voters in the primary, even after he'd switched parties and become a Republican in a city dominated by the DFL. Olson said Kelly will now have to go on the attack against Chris Coleman. "He has an uphill battle because he isn't popular in the two areas he's been popular before, which is the east side, his home base, and then the critical Third Ward, which is very independent and has a large conservative Catholic audience," said Olson. Olson said Kelly's major blunder may have been his endorsement of Republican President George W. Bush last year. Kelly shrugs it off, saying that was the decision he made at the time, and he won't second-guess himself. Kelly said he doesn't mind being underestimated in his re-election bid. He said he was the underdog four years ago, when he came in second in the primary to DFL-endorsed candidate Jay Benanav. Kelly said he's going to campaign on his vision for the city, and the accomplishments of his first term. "If people look at the results of keeping this city affordable, of the additional housing that we have added -- 5,000 units of housing in the last four years -- jobs coming into this city, new corporate headquarters, the transportation advances that we're making in this city, St. Paul is doing very, very well," Kelly said. Kelly said he's the fiscal conservative in the race, and said Coleman would significantly raise property taxes in the city. Coleman's campaign said that's not true. Coleman has said he's willing to raise property taxes to fund public safety and education, and Kelly himself has proposed a 3 percent property tax increase for public safety. Coleman said he plans to reach out to supporters of Green Party candidate Elizabeth Dickinson, who got 20 percent of the vote in the primary. In the final eight weeks of the campaign, it remains to be seen if Kelly's huge financial advantage is enough to overcome Coleman's bounce from the primary.